Murtha Cullina Annual Giving Tree Supports Hartford Mercy Housing and Shelter Corp.
Home > News & Alerts > Press Releases > Murtha Cullina Annual Giving Tree Supports Hartford Mercy Housing and Shelter Corp.
Hartford, CT (January 2, 2014) – For several years, the staff and attorneys of Murtha Cullina’s Hartford office have come together to provide holiday support for the Mercy Housing and Shelter Corporation located in Hartford. Each year, during the month of December, Mercy Housing brings Murtha Cullina a holiday wish list. The firm then takes that list and decorates a Christmas tree with gift tags filled with the holiday wishes of those children and families supported by Mercy Housing. 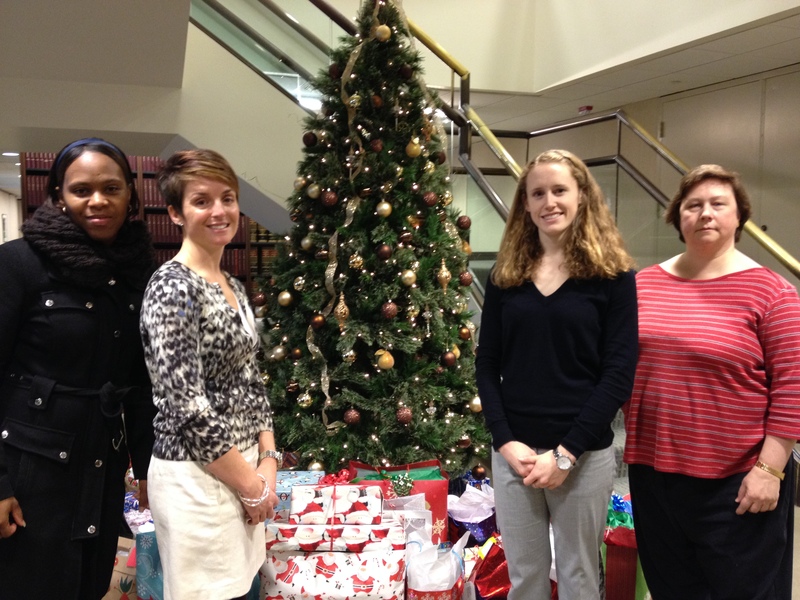 Photo caption: Murtha Cullina’s Hartford office supports Mercy Housing and Shelter Corp. through a holiday giving project. Pictured (left to right) are Keysha Martin with Mercy Housing; Audrey Gehring with Murtha Cullina; and Pam Butler with Murtha Cullina. Mercy Housing and Shelter Corporation provides housing assistance and supportive services to persons who are homeless or at risk of becoming homeless. Mercy works to empower its clients to become independent, so they may live and work with dignity and respect. Mercy seeks to end homelessness by advocating for changes in the social systems that perpetuate homelessness. Mercy welcomes and serves all in need in the tradition of the Sisters of Mercy, who founded the organization in 1983. For more, visit: http://www.mercyhousingct.org. Murtha Cullina is the exclusive Connecticut member firm in Lex Mundi, the world’s leading association of independent law firms; and the exclusive Connecticut member firm of State Law Resources, an international network of independent law firms. Visit www.murthalaw.com.